Fiberglass tubes support circular elements. The result: a high performance antenna that is lightweight, low cost, and easy to install. 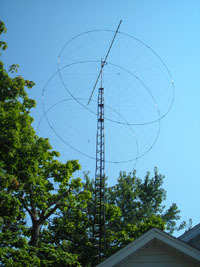 The revolutionary antenna you see pictured, the E-Z-O, was created by N8PPQ as the result of his efforts to reduce the cost of a longtime favorite, the cubical quad. The idea came after a Scouting event, and was inspired by the way tent design has changed, with flexible tubes replacing ridged poles. Cost savings were significant, but the design has several other advantages. The antenna is much lighter than a cubical quad. It also presents less surface area for wind and ice loading. Stresses from gusts are relieved because the elements are not rigidly fixed to the boom. All this allows for a smaller and cheaper boom. And it is easy for one person to install. To top all that, this antenna even performs better than a cubical quad! The square loops of a quad admit to being only approximations to their theoretical ideal: circles. In spite of its humble inception, this could be the biggest improvement in antenna design in over 50 years! Click this link for more about the history of the E-Z-O Antenna. Take this link to see a YouTube video of the performance of a 2 element E-Z-O compared to a G5RV. E-Z-O video of a QSO .